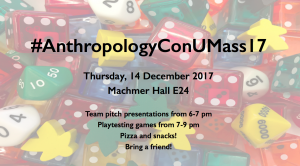 #AnthropologyConUMass17 is Thursday 12/14 from 6-9 pm! Anthropologists have a little-known history of designing games to teach and communicate anthropological ideas, from Bateson and Mead’s “Democracies and Dictators” (1940) to Tsing and Pollman’s “Global Futures” (2005). Student game designers build upon this tradition to create games that model and explore themes in social, behavioral, and cultural theory such as play, cooperation, symbols, power, evolution and change. Pizza and snacks will be served–please come out and play! For more information, contact <kharper@anthro.umass.edu>. I just learned that I will be promoted to the rank of Full Professor as of September 1, 2017. This fall also marks 25 years since I started graduate school at UC Santa Cruz–hard to believe how the time has passed! I am grateful to my family and to all my far-flung mentors, colleagues, and students for helping me to reach this place in my career. Thank you, obrigada, and köszönom! Summer Field Course in Lisbon, Portugal (July 2016)! Application deadline: March 30, 2016. Students should apply through their school’s study abroad office to ensure that credits will be transferred. Course Description: This course will introduce students to the world of urban agriculture viewed through two lenses: cultural anthropology and landscape architecture/design. The Lisbon metropolitan area, with its rapid urbanization and temperate climate, is the perfect place to study the growth of this global phenomenon. Through readings, field trips, and hands-on research, we will learn about the history of growing food in the city and how the urban food system has changed in the past century. The course will examine urban agriculture as an emerging “civic ecology”: an amalgam of social movements working to change the food system and formal institutions’ efforts toward achieving urban environmental sustainability. The course will use Lisbon as a living laboratory for understanding the growth of urban gardening. 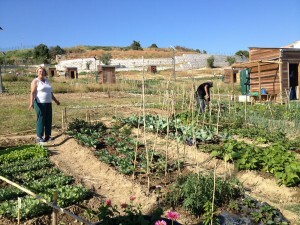 Field trips will take students to urban gardening initiatives and Lisbon’s hidden azinhagas (country lanes), olive orchards, and gardens–remnants of the city’s historical food system. Students will gain in-depth cross-cultural experience through community service learning and a design/build studio project in a local urban garden. No Portuguese language skills required–however, the class will provide excellent opportunities for students to practice conversational Portuguese in the community service placement if they wish and the SiPN program allows you to add on other classes. Cost: $2,500 (3 credits, 24/7 on-site support, housing, public transportation pass, local cell phone + SIM card, weekend field trips are included. Food and airfare is not included) There are partial scholarships and other courses available in June and August as well! 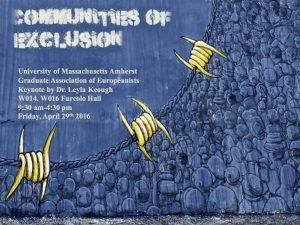 The Graduate Association of Europeanists welcomes submissions for its upcoming conference, “Communities of Exclusion,” to be held April 29-30th, 2016 at the University of Massachusetts Amherst. We seek papers focused on Europe from a variety of academic perspectives and encourage current and prospective graduate scholars at all levels to apply. 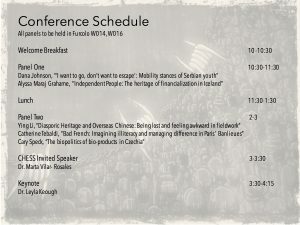 Conference themes will broadly consider past and current transformations of European identity in light of: migration and social exclusion, economic globalization, and the changing role of the state accompanying austerity politics. Conference organizers are also happy to work with scholars to develop papers on topics only partially addressed by the above. The deadline for submissions is March 4th; applicants should send 250-word abstracts to UMassGAE@gmail.com. For any questions, contact GAE President Cary Speck at: cspeck@anthro.umass.edu. The Culture and Heritage in European Societies and Spaces (CHESS) program is pleased to host a seminar with Professor Maple Razsa of Colby College on October 16 at UMass Amherst. Prof. Razsa is an anthropologist, activist and documentary filmmaker. He is committed to using text, images and sound to embody and explore the experience and political imagination of contemporary social movements. He is the creator of Bastards of Utopia, an ethnographic book/film/multimedia suite. Space is limited, so if you plan to attend, please contact me at <kharper@anthro.umass.edu>. Some students wrote about struggling to navigate conflicts and rivalries between individuals and organizations in their fieldsites. Others wrote about feeling like they are getting the runaround–casual friendliness until would-be participants are “too busy” to be interviewed (possibly true, but it certainly makes research hard). And another student who has great contacts and is immersed in participants’ day-to-day lives in a relatively small community wonders–how will she write about the intimate details of family life in a relatively small community without selling folks out? This last student’s question expanded my research ethics vocabulary: It’s an issue is called “internal confidentiality” or “deductive disclosure.” What this means is that in most communities, organizations, or workplaces, all it takes is gender + age cohort + another small personal detail, and it becomes possible for an interested insider to narrow down a small set of possible individuals. Some day, all ethnographers have to write about research participants–and it is almost impossible to provide the rich, ethnographic detail we seek without blowing confidentiality. While in the field, ethnographers usually try to work on expanding their network beyond initial contacts. In this way, you not only get a larger “n,” you’ll insert a little more doubt in potential “nosy readers” who are knowledgeable about your field site. You can also head off this problem by talking to research participants about how the data will be used, what health sociologist Karen Kaiser (2009) calls a post-interview consent review. If that still doesn’t work by the time you are done with fieldwork and writing up, you can also take care in selecting pseudonyms (Guenther 2009). Or consider new journalism techniques like “composite stories” (Zeller 1995) that qualitative researchers sometimes must use to maintain confidentiality when writing up. A good reminder that the sticky webs and ethical obligations don’t go away just because you’ve physically left your fieldsite! Coming in June 2015: Participatory Visual and Digital Research in Action! 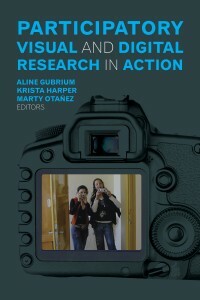 Aline Gubrium, Krista Harper, and Marty Otañez, eds. Cultural anthropologists have often conducted research and written solo, as “The Lone Ethnographer” (see Renato Rosaldo and also Sally Galman). But as time goes on, I find that I enjoy working and writing with other people, and certainly the “participatory turn” has dragged many of us solo authors into the world of co-authorship. Co-authoring mostly depends on the chemistry and dynamics of the people involved–when it works, it really works. I love being able to work on a project and then bat if off to my co-author, have her/him/them work for a few days, and then have them turn around the draft. There are team/time management considerations and tools that make this a LOT easier. 1) MANAGING EXPECTATIONS: Also known as communicating and reflecting. Before you even start, talk honestly about what your expectations are in terms of the timeline for completion, who does what, and order of authorship–and then periodically revisit these questions as needed. For scholars from solo-authored traditions, the variety of ways to order authors is befuddling. Most go in order of effort–but that can be hard to establish until further into the project. Economists go in alphabetical order regardless of contribution, and if asked, they state the percentage effort for each author (Labor economists have even studied the career advantage of an early-alphabet last name!). Natural scientists have an elaborate hierarchy based on level of effort and who paid for it all with their grant money. If there are multiple papers expected, folks often make a “you-go, I-go” deal on who gets to be lead author. The point is, don’t wait until the last minute to discuss it. 2) MANAGING DOCS: If you are writing the same chapter or article (not “you take this chapter, I’ll take the other”)–USE GOOGLE DOCS! Period. The amount of time, frustration, and energy saved from tracking changes, merging, etc. is just huge. If your partner balks, take the time to have an in-person training session to walk them through the process of using GoogleDocs. 3) MANAGING REFERENCES: Early in the process, especially if it is a book, come up with a way of managing the bibliography. It could be as simple as a GoogleDoc file, but if it’s a co-authored book or a series of articles, it’s smart to invest some time in learning Zotero, RefWorks, Mendeley, on another online reference management system. My co-author and I used EndNote, but merging files made our bibliography a bit clumsy. 4) MANAGING WORKFLOW, PART I: Whether you are in the same town or on different sides of the world, regularly scheduled check-ins are key. So schedule a weekly check-in by skype or in person, and use it to come up with a division of labor, do-able tasks, and realistic deadlines. This is how you stay tuned in to each other’s needs, ideas, and expectations. You’ll need to be flexible–it’s inevitable that you or your partner may sometimes miss a week because of illness or being overwhelmed with other projects. That’s fine, but get back in the saddle even for a short time the following week. Just as in solo writing, chipping away at those little tasks moves you forward. 5) MANAGING WORKFLOW, PART II: Use a project management tool like https://trello.com/–this helps a pair or group of people communicate and coordinate what you need to do, are doing, and have done already. Trello is amazing discipline for task management. 6) THINKING TOGETHER: A lot of the joy of co-authoring is the escape from your own single perspective, which can become paralyzing in solo writing. Once in a while, schedule an in-person workday–this might mean staying on an extra day at a conference if your partner lives far away. It is well worth it to have that face-time for planning, structural edits, or combing through a draft. If you can’t be in the same place very often, a collaborative visualization tool like https://mural.ly/ allows you to have a shared online whiteboard with post-it notes for brainstorming and re-ordering ideas. 1) A dynamic that can be tricky for junior faculty is writing with your former advisor and having to assert your grown-up status. 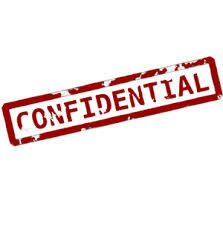 But this very much depends on the specifics of the relationship and being confident enough to state what YOU need. 2) A co-author who rarely works on the project, or who is less invested in publication but gets in the way of the other author. If you find yourself in this situation, it’s time for a heart-to-heart with your co-author and develop a plan for finishing. Otherwise, you may need to cut your losses. Well, that’s all–I’d better get back to writing my draft before my co-author finds out I am blogging instead! The anthropological literature dealing with problems of “transition” out of socialism has shed little light on the accelerating revitalization of “magical practices,”occurring throughout all the former socialist orders in Europe. This is in part because there is little consensus today within Anthropology about the meaning, significance or “functions” of “magical practices. One result of this is that the topic is often deleted from (left out of) most accounts of life today in almost all these nation-states. As in the past then the topic of magic has largely been left to the region’s folklorists and ethnologists. This has particularly been the case for example in Romania where little attention has been paid to the increasingly“normalization” of traditional belief like magic that has occurred since the 1989 Revolution. It may well be that increases in “magical practices” point to a growing “disenchantment” with all modernist discourses and a concomitant “re-enchantment” of locally defined and positioned identities, cultures and practices. al practices” point to a growing “disenchantment” with all modernist discourses and a concomitant “re-enchantment” of locally defined and positioned identities, cultures and practices. At the same time, this increase in “magical practices” may point to further “universal” commodification (or reinvention) of cultural beliefs and practices that serve elite agendas like “cultural tourism.” This session is seen as an opportunity for scholars interested in magic throughout Eastern Europe and the Baltics to share experiences, create debate and to collaborate. Please contact the organizer, James Nyce, at .